Tall tumblemustard is a plant with many branches growing from a single stem and a stout taproot. It is initially a low-growing rosette of basal leaves, but later becomes tall and lanky in appearance, growing up to five feet in height. The round stems are light green and mostly smooth, except for widely scattered white hairs. The widely-spaced alternate basal leaves are up to six inches long and whither with age. 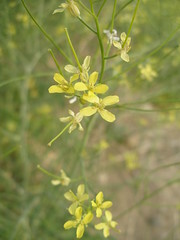 Small, pale-yellow flowers give rise to long linear seedpods up to five inches long. A single plant can produce up to 12,500 seedpods, with 1.5 million seeds. In the fall, the dried parent plant breaks off at the base of the stem and its circular profile allows it to “tumble” across the landscape. The seedpods are tough and shatter slowly, so only a few seeds at a time are released. In our windy climate, the seeds may be dispersed over miles and miles of terrain throughout the fall and winter. With this effective seed dispersal method, tumbleweed could be a highly invasive weed. It is prolific but it does not require special control measures. It requires full sun and poor soil, so as other plants fill in or the ground is covered with plant debris, tumblemustard is outcompeted. Small infestations of tumblemustard can be controlled by hand pulling the rosettes in the fall or early spring. Tumblemustard may be confused with Russian thistle, which is another tumbleweed. However, tumblemustard is much less dense, has a light straw color, and is not as prickly as Russian thistle. Tumblemustard attracts honeybees and butterflies. The greens can be used in salads.